Countries across the world have been facing extremely high temperatures this summer. From the UK, across to Scandinavia and Japan, the hot weather is expected to continue for the rest of the month. Japan has just declared a natural disaster, with high temperatures leading to thousands being admitted to hospital with heat stroke. Various temperature records for July were broken in southern California, eastern Canada, Algeria and Norway. In Oman, the coolest overnight temperature was recorded at 42.6 C - which may well have been the highest low ever. Sweden has been hit by forest fires spreading as far north as the Arctic Circle. In Greece, at least 60 people have died in wildfires in the region around Athens. Reality Check has looked at the global picture - which countries have been hotter than normal? Many countries have experienced above average temperatures in the month of July so far. The map shows the countries where temperatures are higher or lower compared with what you'd expect for this period of time. Blue colours indicate cooler temperatures than the 1981-2010 regional average, and red shows where's its been hotter. UK, Scandinavia (in particular Norway and Sweden), eastern Canada, parts of eastern Siberia, Japan and the region around the Caspian Sea. Parts of southern Europe including Spain and Portugal, parts of northern Siberia in Russia and and the southernmost part of South America. 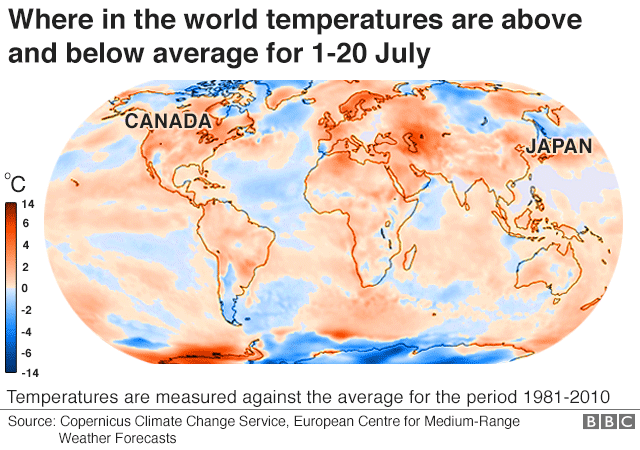 Based on the data used to populate the map, collected by the Copernicus Climate Change Service, the hottest July on record in Europe was 2010. Then it was two degrees above the average. July 2018 is likely to rank among the hottest for Europe, but is unlikely to be number one. Globally the month was the fifth hottest June since 1880, according to the US National Centers for Environmental Information. In the UK, this June was provisionally the third warmest since 1910 and the average maximum temperatures were between 2 and 3 °C above average in most areas, according to the UK Met Office. What's behind these high temperatures? There's never one single factor that explains hot weather around the world. The BBC's science editor David Shukman says: "What is striking now is that multiple heatwaves are happening at the same time." "The key is the jet stream. This year it's been meandering in great loops and the UK has ended up to the south of it. Add to that sea temperatures similar to previous heatwaves and climate change, the warming of the atmosphere - it all makes heatwaves more likely. "Climate scientists are not saying we will get heatwaves every year. But they do say the risks of extreme heat are going up."